The summer of 1913 was for Arsenal one of great sadness and great excitement. Sadness at leaving the homeland that had seen the club form as a works team for the Dial Square factory in 1886, and sadness at the animosity that had grown up surrounding the club and its proposed move. And most of all sadness at the fall from the first division back to the second at the end of the awful 1912/13 season. But now great excitement at the new ground, and the prospect of playing in front of much, much larger crowds, for surely there can be nothing more depressing to a footballer than playing in a ground in front of 8,000 that had previously being accommodating 15,000 to 20,000 on a regular basis. There was of course publicity for the new club, but it was not all bravado and advertising, for Henry Norris, for all his reputation as a man of outspokenness knew exactly when to speak and when to stay quiet. Indeed it was the latter approach that he adopted when he attended the meeting of Islington Council in April 1913. After hearing from the Highbury Defence Committee, the Council voted to do what it could to stop the move of the club to Highbury. Norris was at this meeting but said not a word. He knew that the Council had not a hope of stopping him, so he left it at that. But more than that, Norris understood psychology, although I am sure he never used the word. He knew that having three teams in close proximity would not reduce the crowds, but would instead enhance the interest in local football by keeping it in the papers all the time. He knew that what had enhanced Arsenal in 1903/4 as the club achieved promotion and made Plumstead feel so proud of its team, was the same force that had caused recriminations and mistrust as things fell apart in 1910. In both cases it was the inward looking small town environment – and it was from this that he was removing the club. Hence his search for a new type of supporter – the clerks and office workers, who would travel to games by train and tram, rather than the men who built the munitions for the military and who would walk to the ground from their homes. During the summer of 1913, while Norris and Hall were totally engaged in the work of building Highbury to make it ready for football in September, the directors of Arsenal, who were also directors of Fulham, tendered their resignations from that club. That they had not done so sooner was undoubtedly because in 1910 neither man expected to be involved at Arsenal for more than one season. They truly had believed they would be able to go in, solve the crisis, and leave, most likely with the clubs amalgamated as one, or as a fall back, moving Arsenal into a ground share operation at Craven Cottage. And interestingly Fulham did not want its two most famous directors to leave. Norris was clearly a man of power and influence who had done a brilliant job in seeing off the legal challenge from the LCC over the issue of the legalities concerning the rebuilding of its stand. He was Mayor of Fulham, and seemingly a friend of some of the hierarchy of the Church of England. He was full of energy, and was powerful. Just the man that was needed. Hall was now on the management committee of the Football League – the south’s only such representative and so to have him as a director at Fulham was also handy for local and regional PR. Indeed as proof of this feeling (as Sally Davis reports) at the Fulham FC AGM on Friday 27 June 1913 the shareholders passed a resolution to go to the Football League asking that the two men should be allowed to continue to serve as directors. Actually they had no need to do this since dual directorships were not against the League’s rules – otherwise Norris and Hall would have been challenged during the three seasons that had since elapsed. And indeed at this meeting the issue was not on the agenda, but write in these shareholders did. Henry Norris continued as a director of Fulham FC but Hall stepped down (as well as selling his shares in Fulham), citing his membership of the management committee wherein he was obliged to step aside if Arsenal were ever discussed. He didn’t want to have to miss out on discussions concerning Fulham as well. Woolwich Arsenal (as they were still known) began their existence in terms of an active north London club on 20 August 1913 when Arsenal played a practice match at Fulham, prior to the start of the new season. The match was reported as the Whites against the Reds, with the Whites winning 2-1. Unfortunately the Reds was the first team players and the whites were reserves, but such things happen. A second match was played the following Wednesday, this at the Den, the ground of Millwall opened when they moved south of the river in 1910. This time we have the game noted but with no details. Meanwhile in this build up to the new season Norris was also doing as much PR as he could to promote the new ground, being interviewed, showing people around the ground, having journalists driven back and forth in his car. The reason was obvious – Arsenal’s attendances had slumped in the final Plumstead season and they had ended the season 27th in the league table based on the crowd figures. These numbers come from european-football-statistics.co.uk for 1912/13. Arsenal’s crowd were down 19.2% on the previous season as the club slid from the first towards the second division. What Norris was aiming at was a crowd average of 20,000 or more so a rise of well over 100% – far in excess of anything seen before. It would also make Arsenal the second division club with the highest crowd, and exceed the highest ever average gate at Plumstead which was achieved in 1904/5 when Arsenal’s average crowd was 19,980 to watch the club’s first season in the first division. On 30 August the first ever match was played at the Gillespie Road ground, and again I am sure from the comments made relating to events on the first league match the following Saturday, this once again was behind closed doors. Or it would have been if the gates and turnstiles had been installed by then. I think we can be fairly sure this was another first team against the reserves match. And then finally, ending a process that had effectively begun at the meetings in Plumstead on 22 January 1910, Arsenal played the first match at the ground which would eventually be known as Highbury, on 6 September 1913. 20,000 turned up, exactly what Norris wanted, and Arsenal beat Leicester Fosse 2-1 in what was the first opening day victory since 1906. Optimism for the country would have been misplaced, for in just over a year the kingdom would be part of the most appalling loss of human life for the country of all time. And yet for Arsenal the move to north London in 1913 was the start of a new world and a new life. True, our first manager at the ground didn’t manage to get the club back to the second division, but still it all turned out right in the end, thanks to the incredible investment and belief in the club by Messers Norris and Hall. Here’s the starting point, written as always by George Allison, who went on to win the title twice as Arsenal’s manager in the 1930s. Perhaps most interesting is the fact that the 1912/13 disaster, in which Arsenal got its worst ever record, is blamed largely on an injury crisis. But because Henry Norris was in north London sorting out the new ground, and because all finances were directed that way, there was no chance of buying in new players to shore up the team during the 1912/13 season. Woolwich Arsenal had lost £2,000 in its final season at the Manor Ground (plus the £250 the directors had to pay out for the benefit to Shaw). But that was nothing compared to the cost of preparing the Gillespie Road ground through the summer. This was estimated at £20,000 and Norris paid for this out of his own pocket. Building a stadium takes time – but no one told Norris that the task might be beyond him, and even if they had, he would not have listened. The lease for the land was signed at the end of April 1913, and the first game at Gillespie Road took place on September 6th meaning the new ground was prepared for the first match in around 100 days. For this very first match a marching band paraded before the game and at half time and there was a specially composed piece of music for the occasion. Norris the showman was at his best. True, the ground certainly wasn’t ready and the grandstand was far from finished. But the mood in North London was electric. Both Tottenham and Arsenal started the new campaign well, with both sides winning their first three fixtures. Tottenham beat Chelsea and Sheffield Utd (twice) scoring nine conceding three. Arsenal beat Leicester, Wolverhampton and Notts County, scoring seven conceding two. In the local press the response to Arsenal changed, with letters now commenting that within quarter of an hour of the game ending, the streets were once again quiet. 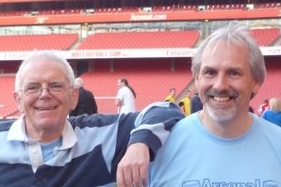 Football terror had failed to raise its head in middle class Islington. And the crowds were right on target. The second home game played in the late afternoon on Monday 15th September has the crowd recorded at anything from 12,000 to 20,000 – although the latter number is the one most writers seem to quote. Even the reserves at Gillespie Road could pull in more than the first team’s final first division match at Plumstead. As for the name of the ground, the programme for the first game refers to “Football at Highbury” but also mentions “Forthcoming Matches at Gillespie Road”. Brian Glanville in his history of the club says that the ground was renamed “Arsenal Stadium” in 1914 but there is no supporting evidence, and indeed the handbooks up to 1932 have no mention of “Arsenal Stadium” as being the club’s address. It is not until the handbook published in 1933 that the club uses the words “Arsenal Stadium” in the address for the first time. A season ticket at Highbury in 1913 was charged at £1.05p in contemporary currency, with the added bonus of “Bring your own lady and get a discount” – an interesting notion. 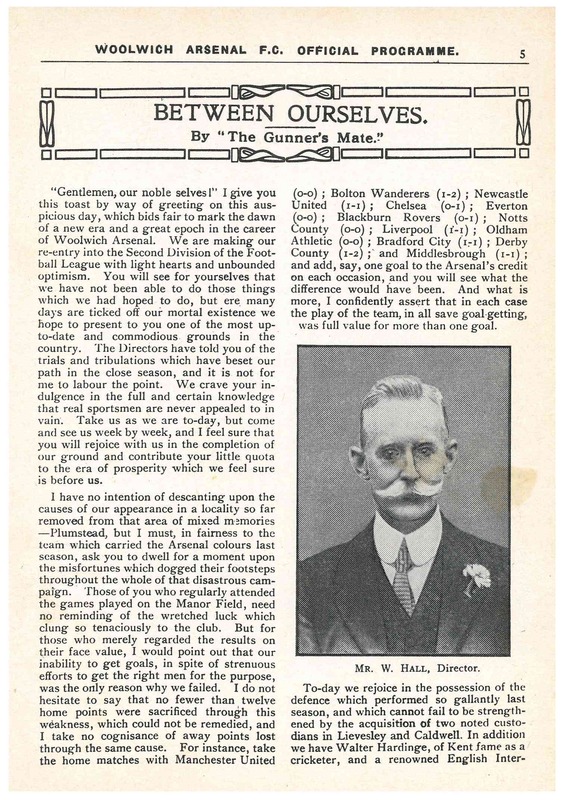 The opening day’s programme had adverts for shares in the club on virtually every page. Oh for a time machine enabling one to trot back and pick up a few. Maybe a few hundred for cash, and a shake of the hand from Henry Norris! 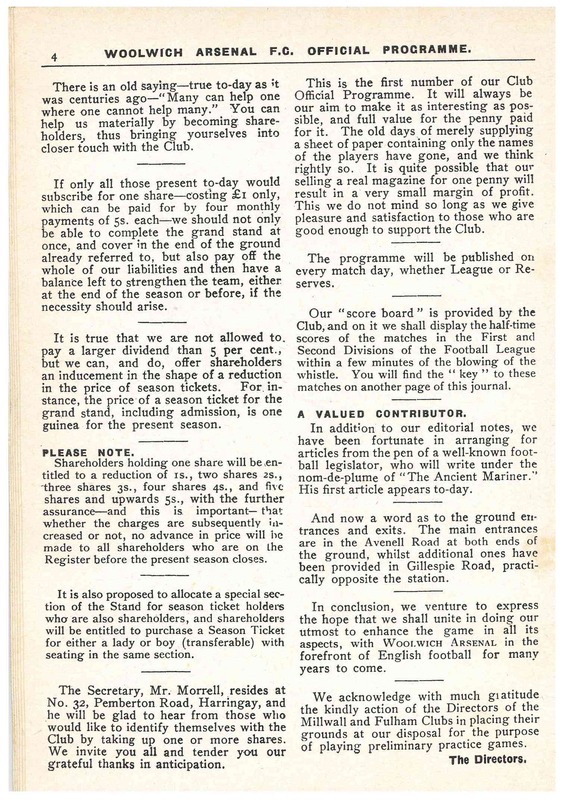 The promise as we can see from this programme extract, was to use the money to pay off debts and finish the grandstand. The address of the club’s manager is given – anyone wanting shares could pop in, pick up the certificates and perhaps offer a few words of advice as to how the defence might be improved. The season tickets sold for a guinea, with a discount if one bought a share at the same time – and you can have your lady sit next to you too. There are some nice details here as well – a recognition of the two pre-season training games that were held away from Gillespie Road because the ground was still full of builders’ rubble, and the introduction of what was the first Arsenal magazine style programme. I don’t have a Woolwich Arsenal programme from earlier than this – but it appears from this page that these were not as detailed as this production. It is also nice that the club introduces the A to Z scoreboard which some may still remember as it was still there in the 1960s. The whole story of the move to north London is covered in Woolwich Arsenal, the club that Changed Football, which is available on Kindle, and in paperback (email Tony@schools.co.uk if you want a copy). The newspaper report of the day’s match shows Tom Winship’s corner was headed in by Jobey and says, “Jobey received a kick in the back from a Leicester player and was treated by doctors and ambulance men before being taken home on the back of a cart borrowed from a local milkman.” The injury was thought to be broken ribs but they were just bruised. It is reported that the player was attended by Dr Brenber, brother of the Fosse goalkeeper. The wheelbarrow story telling from Bernard Joy in his account, and repeated by others, gives a feeling of their being no facilities at all – and worse, no forethought about what might happen if someone was injured. But the Islington Gazette speaks of ambulance men – and where there are ambulance men there is usually some sort of preparation and ability to get matters sorted. There would have been no motorised ambulance in Islington in 1913, and milkmen were one of the groups of people who had a suitable form of transport that might allow an injured person to be transported. While the wheelbarrow sounds ludicrous as a way of carrying an injured man, hiring a milk delivery wagon (which had open sides and a horse used to pulling a load through the streets of London) would be ideal. The milk delivery company would have finished its lunchtime round by kick off and not started the evening delivery that was common at the time, until after the match finished. Hiring a horse and cart in this way made perfect sense, and quite possibly it continued as the arrangement for taking the injured away from the ground until long past the first world war. So it is more than likely that Jobey was taken from the ground to his lodgings once the doctor had asserted that no ribs were broken. Bruised ribs are very painful indeed, as anyone who has had them will know, but there is no treatment other than lying still and letting the bruising settle down. What’s more at this time players tended to rent rooms in the streets around the ground and the locals who had rooms to rent would certainly have looked to take in anyone they could from the newly arrived club. But more to the point, if the wheelbarrow story were true, or if the milk cart tale was unexpected and unusual there’s no doubt that the local paper would have used it and run with it as a major feature. I think the wheelbarrow and the suggestion of total chaos at the ground came much later, and gained popularity as so many other stories have done, by being included in Bernard Joy’s book.